The attorneys of Carluccio, Leone, Dimon, Doyle & Sacks know what it takes to represent your interests. We follow a collaborative “team” approach which allows us to maximize all available resources and provide you with the complete package in an expeditious, cost efficient, value added manner. Collectively, our sixteen attorneys have over 440 years of diverse legal and business experience, which enables us to offer a full suite of services. All of the firm’s knowledge and talent are always brought to bear on your behalf. We are one of the Jersey Shore’s leading full-service law firms, encompassing a wide variety of practice areas. We strive to communicate with our clients and keep them informed of progress and important issues pertaining to their case. We strive to be a value-added provider of legal services and obtain the very best possible results for our clients. Mr. Gutman has been our family as well as business attorney for some time now and I highly recommend him. He is prompt, courteous, knowledgeable, a real people person. He makes you feel as if you have been long time friends from the moment you meet but yet keeps his stature of professionalism. And if I call him with something that he does not handle he makes sure that someone in his office takes care of me. I know I can call on him day or night and he will be there. He is simply the best! One of the most remarkable things about our experience with Ed Dimon was his caring and concern. He treated us like family and helped keep my son calm as we went through several anxious months and multiple visits to the courts. I was referred to Ed Dimon for legal representation of my son by an attorney friend and right from the beginning of our first meeting, Ed started developing our approach for going to court. Associate Peter Draper and legal secretaries Mary Ann Romano and Nancy Nichols worked with Ed ensuring my son had a solid team diligently working towards the best possible outcome. While finding an attorney to represent you is simple, just look at your mail after you are arrested. Finding a great attorney that will represent you and make certain that your outcome is the best it can be under the circumstances is not so easy. 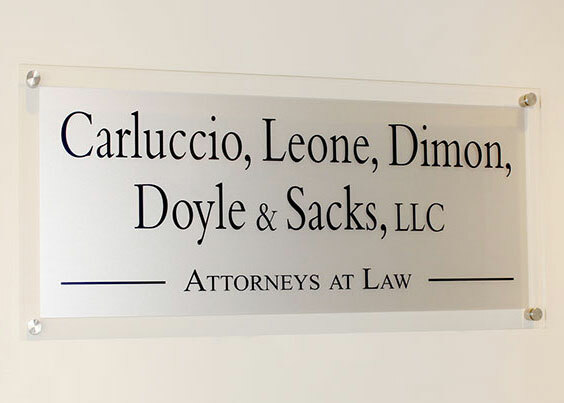 The professionalism and knowledge of the attorneys and staff at Carluccio, Leone, Dimon, Doyle & Sacks, L.L.C., will give you the confidence that you are in good hands! In a very difficult and unfair situation I found Mr. Dimon and could not be more appreciative for his work. He was always concerned about my case and very good at keeping in touch and explaining what needed to be done. Anyone who needs great legal services will find in Mr. Dimon the right person to work with As well As his firm. Mr. Dimon definitely cares about his clients and does his best to help you with what is needed. Me and my wife used Mr. Draper to purchase our home in the beginning of this year 2016. He was a great help providing all the information I would need in the process. Mr. Draper made many suggestions along the way to help smooth the process. We had a terrible mortgage company we used that gave us the run around, Mr. Draper was great in filing all the paperwork for us, including quit claim paperwork. It was fast and efficient. We couldn't be happier and will continue to use his services in the future. Mr. Dimon has been such a great help. Not only did he take the time to hear out my issues, he was able to get back to me in a timely manner. I would definitely recommend him to everyone I know. In my 35 year professional career, I have had many occasions and situations that required legal representation. The representation I received From Ed Dimon, Esq, Peter Draper, Esq, was absolutely by far the top of the pyramid, the best a client could have ever wished for. My cases required a law firm that was willing to ‘think out of the box’, and go against what I was told would be ‘impossible’. Well, Mr. Dimon, Mr. Draper, and his entire team, proved that NOTHING is impossible. They literally attacked my case, covered every inch, reported to me on every occasion, and every time I called I received an immediate response. The entire staff I dealt with, Ed Dimon, Esq, Peter Draper, Esq. their paralegal assistant MaryAnn, the receptionists, and Linda Andrews in the account/financial department, were ACE’S. I felt like family … Words can’t totally describe my GRATITUDE, but Thank You so much for making my dream come true!!!!!! !